Each tree ring contains an image of the time when the ring formed, projected onto the ring's size, structure, and composition. Tree rings thus are natural archives of past environments, and contain records of past climate. 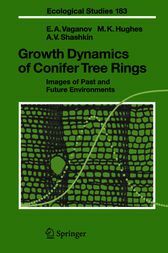 While dendrochronologists have investigated the impact of climate on tree-ring growth by empirical–statistical methods, this volume presents a process-based model complementing previous approaches. Basic ideas concerning the biology of tree-ring growth and its control by environmental factors are treated, especially for conifers. The use of the model is illustrated by means of several examples from widely differing environments, and possible future directions for model development and application are discussed. The volume provides an improved mechanistic basis for the interpretation of tree rings as records of past climate. It advances process understanding of the large-scale environmental control of wood growth. As forests are the main carbon sink on land, the results are of great importance for all global change studies.